Which One is Better? Granite, Quartz or Marble? 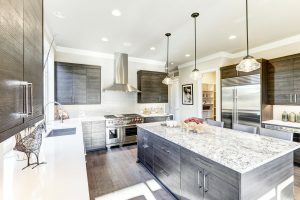 Which of these kitchen countertops is better? Granite, Quartz or Marble? This has been the question of homeowners for many years now. Well, in all reality, it comes down to preference. Granite countertops have been chosen by homeowners for decades now. It is a completely natural stone that is incredibly durable, heat resistant, scratch resistant and virtually stain proof. It comes in a variety of colors, requires almost zero maintenance and looks elegant in any kitchen. Because they are virtually maintenance free and will last an entire lifetime, granite is one of the most cost effective natural stone countertops on the market. Quartz has recently become very popular for kitchen countertops as well. While it is approximately 93% natural stone, it is held together and sealed by 7% resin. Because of the process by which it is made, quartz provides more even coloring than either granite or marble and can be customized more easily to match you décor. The resin in the countertop provides a complete seal which removes any concern about staining or bacterial growth that can occur in countertops that are not sealed properly. It also handles cleaners and detergents well and will easily last as long as your home. Marble is an excellent choice for countertops and has been around for many years as well. It is known for its beautiful coloring and the elegant swirls that cover the entire surface. While the most common colors are white and grey, marble does come in a variety of colors that include blue, pink and even purple. It is a hard stone that is scratch and heat resistant, but does have a tendency to stain more easily than either granite or quartz. Choosing new kitchen countertops can be a difficult decision. There are so many good options out there. Just rest assured, there really is no right or wrong answer. The best counter top for you is the one that you think suits your needs.